There are many good reasons for choosing a compact chainsaw: advanced technology and safety features based on those of the professional saws, easy handling and an ergonomic design for working without tiring. STIHL compact saws are ideal for thinning shrubs and bushes and small trees, as well as for cutting firewood.These models are available as basic versions or comfort models (C), Chain Quick Tensioning (B) and ErgoStart (E) for jerk free starting. Stihl chainsaws include the Stihl MS271, MS291 and the MS391. 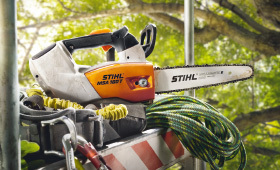 As market leader, STIHL light, top-handled saws are ideal for arboricultural work. With a great power-to-weight ratio and accurate guidance, optimum handling and outstanding cutting are the standard for these saws. For sale only to accredited, professional tree surgeons.